Many organizations are drowning in unstructured data, which can break traditional storage infrastructure. We'll take a look at different ways to handle unstructured data with particular emphasis on object storage. Alexey Malanov joined Kaspersky Lab in 2004, where he began his work as a virus analyst. He has since been appointed Head of Kaspersky's Anti-Malware Team and in 2012, shifted his focus to analyzing technology trends and risks. The threat posed by a Strong AI (artificial intelligence where the machine's intellectual capability is functionally equal to a human's) is well-considered in many science fiction films. But the invention of a Strong AI will take many years, so we can afford not to hurry with the study of "laws of robotics." However, we are already facing growing concerns. The use of machine learning in various fields has shown that algorithms often make strange, discriminatory and difficult-to-understand decisions. Moreover, it has been clearly demonstrated that a person can cheat algorithms to achieve desired results. Alexey addresses some of the looming issues surrounding the AI algorithms that are becoming a part of our daily lives, and will increasingly affect us and our decisions. Whereas hard sells might have worked before, nowadays prospects don't want to be sold to. Creating a communication strategy that includes content, touch points and value added social media will engage your prospects to eventually know, like and trust your brand. And once they trust your brand, they are more likely to convert into paying customers. Join Kelly Harris, Senior Content Manager at BrightTALK, as she interviews Jean Ginzburg, Founder & CEO, Ginball Digital Marketing, on how to create an engaging communications strategy for your business. Join Simon Evans, CTO of Amido, as he takes a technical deep dive into key priorities for next-gen CTOs and what they should be considering for their 2020 strategy and beyond. Simon will bring perspective from both the CTO of a consultancy, but also from the perspective of their clientele who are primarily Enterprise CTOs. Join us for this live Q&A and get all of your questions answered! Join Darien Hirotsu, Solution Architect at SDN Essentials and Kelly Harris, Senior Content Manager at BrightTALK, as they take a technical deep dive into software-defined networks and automation. He will share expert insight into what he wish he had known about software-defined networking and automation years ago, and help you jump start your SDN solutions. Audience members are encouraged to send questions to the expert which will be answered during the live session. How easy is it to move data? Between traditional, on-premises data centers, hosted/collocated data centers, and infrastructure as a service (IaaS) through the large cloud providers, where to store your data and run your business critical applications is now a source of significant complexity in the IT world. Understanding your application set and business needs, then determining where best to run those applications and store their data presents a host of challenges both old and new. So where does Third Party Maintenance fit into all of this? Or better yet….what IS Third Party Maintenance? Chris primarily works in the Services department as a Solutions Architect developing technological solutions and strategies for clients. As a technology expert, Chris leads a team of technical engineers to develop new tactics and processes for clients from development to design. Chris was named Employee of the Year in 2005 and 2009. Glenn is responsible for the strategic growth and expansion throughout Europe. Previously, Glenn managed Curvature’s international operations and led the company’s entry into Europe in 2002, successfully launching Curvature’s Asia-Pacific division in 2007. Prior to leading this international expansion, Glenn managed enterprise accounts as a distinguished member of Curvature’s U.S. sales organization beginning in 1996. Join Robert Starmer, Cloud Advisor & Founding Partner, Kumulus Technologies and Kelly Harris, Senior Content Manager at BrightTALK, as they take a technical deep dive into enterprise containers in 2018. - What does it take to move from a classic monolithic multi-tier app to a microservices on Kubernetes approach? - How does one deal with the change in the security attack surface changes? - How do I manage my developer's integration into a cloud system? - What do I get from the process/pain that is sure to exist in the transitionary phases? Join David Cuthbertson, CEO of Square Mile Systems, as he takes a deep dive into cloud management. Many senior decision makers have negative feelings regarding the issues of technical teams and don't want to bring them to light - data security, change control, lock in to a supplier who overcharges, proper outage stats, etc. Just as there is more awareness of outsourcing contract nightmares, many of the same issues apply to cloud providers. Managing change in cloud-based systems is still a relatively new issue as most technical teams don't think about how cloud systems are managed and the potential risks posed by many suppliers without a viable business model. Join Sarah Kocianski, Senior Research Analyst and FinTech expert for Business Insider Intelligence, who will share her insights from her many conversations with legacy banks, neobanks, and everyone in between. - Can neobanks take market share from incumbent high street banks? - How can neobanks (Monzo, Starling, Revolut) in crowded markets stand out from each other? - What's the future for incumbent banks under open banking and PSD2 - will fintech startups become customers' primary interaction channel? - What do incumbent banks need to do to meet changing customer habits and expectations? - What impact does regulation have on innovation within the banking sector - does it help or hinder? Audience members are encouraged to send questions to the expert, which will be answered during the live session. Join Christopher Brown, CTO of Uptime Institute and Kelly Harris, Senior Content Manager at BrightTALK, as they take a technical deep dive into data center infrastructure management in 2018. - What really makes a well-run data center? - What Tier level do I need for my data center(s)? - What can you tell us about the typical issues we see every day? - What are the challenges ahead for data centers? Audience members are encourage to send questions to the expert which will be answered during the live session. If you work in IT Service Management, you need to hear what James Finister has to say about monitoring and metrics tools and best practices. If you've already had an ICO or are considering one, you need to hear what David Siegel has to say about regulations, jurisdictions, tax, banking, KYC/AML, identity, security, marketing, and more. Audience members are encouraged to send questions to the experts, which will be answered during the live session. -Tech-driven vs. bank driven mobile payments - is it too late for banks to enter the mobile payments market? This webinar will about the creative side of asset management marketing: ideation & execution. How do you create, or re-create a legacy brand? What conversations need to happen, how much creative license is used, and where does inspiration come from? Is a different type of creativity than what people expect? How does data, customer feedback & regulations figure into the creative process? What considerations are needed to enter a new market? Join in live to ask your own questions. Join Jeanne Morain, Digital Transformation & Cloud Computing expert, author and speaker, who will discuss the basics of Licensing-as-a-Service, why it's a critical component of IaaS cloud model, how it supports enterprise application monetization and security, and more. 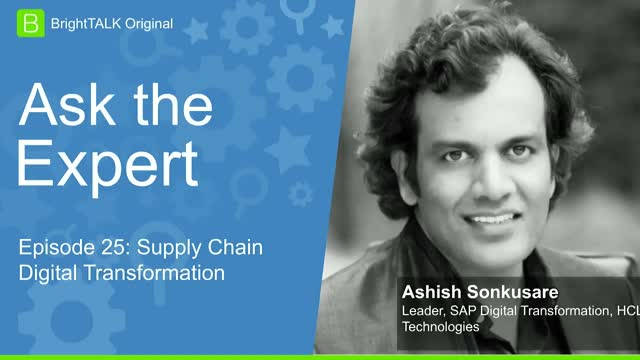 This webinar is part of BrightTALK’s "Ask the Expert" Series. As attacks increase and start to have a significant impact, not just on companies’ bottom lines, but on their ability to carry out everyday business, cybersecurity has become much more of a boardroom issue than ever before. Increasingly this is causing forward looking organizations of all sizes to examine how security can be better integrated into business as normal. No business is immune from cybercrime and the theft of personal information and intellectual property will increase as the ability to turn raw data into money-spinning opportunities increases. The response to cybercrime is a business decision – and is all about risk management. Between human error and malicious insiders, time has shown us the majority of data breaches originate inside company walls. Employees and negligence are the leading causes of security incidents but remain one of the least reported issues. The fightback starts not in the organization but with people and increasingly in the home. More and more security professionals need to be re-assessing the risks to company data at a personal level - mobile/consumer devices, internet connected devices, cloud access and storage both inside and outside the corporate environment. Sign up for this BrightTALK series where each week we'll focus on a different topic or skill and will invite an expert to answer all of your questions live.